The2-day tournament will kickoff off on Saturday 22 October and will feature 8 teams. 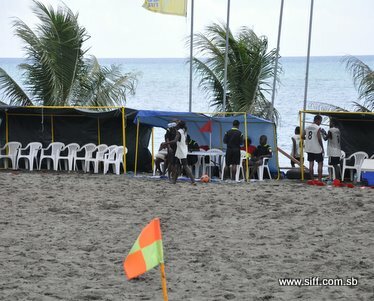 The Solomon Islands national beach soccer team training squad will be represented by 2 teams in the competition, the Bilikiki Fliers and the Bilikiki Sliders. Organisers are expecting great interest from teams in Honiara looking to claim the other 6 spots in the competition. Coordinator for the Bilikiki Challenge, Gideon Omokirio says that the competition’s management looks forward to hosting the competition and anticipates higher interest from the public based on the turnout for the national championship held in July. “Since the introduction of the national beach soccer championship in 2010 this code has become more and more popular. In July, we had amazing turnout from spectators and we hope that this can be repeated in the Bilikiki Challenges,” Omokirio says. The Bilikiki Challenge is part of plans for regular beach soccer competitions to be held in Honiara. More such mini competitions are planned to take place in 2012. The competitions are designed to promote beach soccer and also assist with the national team’s preparations for regional competitions. SIFF is organising this Bilikiki Challenge in collaboration with beach soccer major partner, DJ Graphics Ltd.